The following report was released by the United Nations on September 16, 2013. 27. 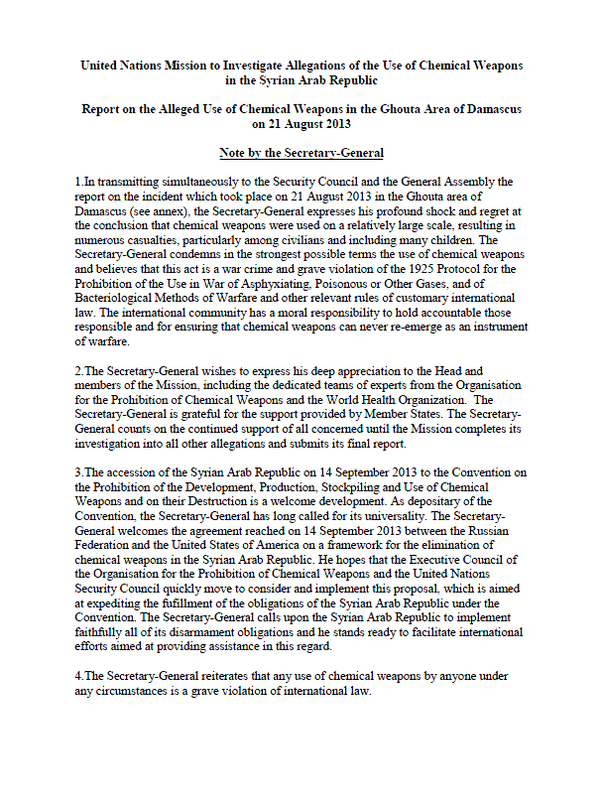 On the basis of the evidence obtained during our investigation of the Ghouta incident, the conclusion is that, on 21 August 2013, chemical weapons have been used in the ongoing conflict between the parties in the Syrian Arab Republic, also against civilians, including children, on a relatively large scale. 28. 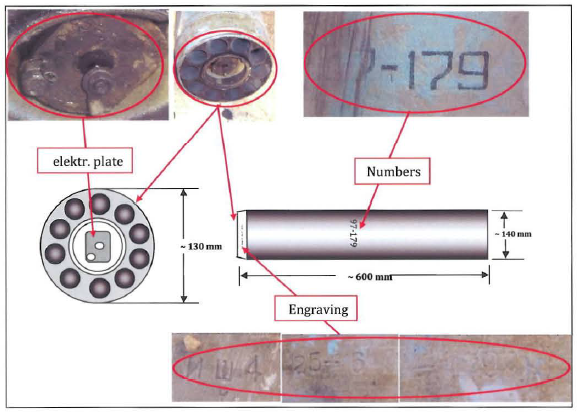 In particular, the environmental, chemical and medical samples we have collected provide clear and convincing evidence that surface-to-surface rockets containing the nerve agent Sarin were used in Ein Tarma, Moadamiyah and Zamalka in the Ghouta area of Damascus. The team began the investigation of an alleged impact site which was initially located in the backyard terrace of an apartment building. The information given to the Mission was that, in and around this building, persons either died or were affected by a toxic material after coming under attack via barrage on the 21 August 2013. The members of the Mission discovered, at this location, a small crater/impact point in the stone tiles which formed the floor of the terrace. Stone and earth debris were scattered outside of the crater as well as small metal fragments were visible in the locality. Of primary interest was the intact rocket motor found coincident to the impact crater. This rocket motor was noted to have stone and earth debris impacted in the front section of the motor identical to that found in the crater. There was no indication of damage around the crater area having been caused by blast or explosives. This implies that the warhead was not present upon final impact. Noting the location of the impact crater and other damage to the upper parts of existing fence/trellis work, the inspectors followed the trajectory of the rocket and determined that it initially impacted the comer of the second floor of an adjacent apartment building to the east, with either the warhead functioning or shearing off from the body at that point and the motor section having sufficient kinetic energy to continue along its path to its terminal impact location. Following an overall reconnaissance of the area, the members of the Mission took samples, made detector readings (no detection indications on the LCD 3.3) and took measurements of the area and the discovered munition. The scene was photographed and video was recorded throughout the entire activity. Upon further discussion with alleged witnesses, the team moved to the adjacent apartment building where the initial debris from the first impact/functioning of the rocket was found. The Mission was told that the inhabitants of this location were also injured or killed by a ‘gas’. This location was also surveyed and no intact identifiable munitions fragments were located. Masonry debris and smaller metal fragments were noted and relevant samples were taken both inside the apartment where victims were alleged to have been as well as from the debris field.